Cool looking pine-cone-like plant without spines and irritating glochids. 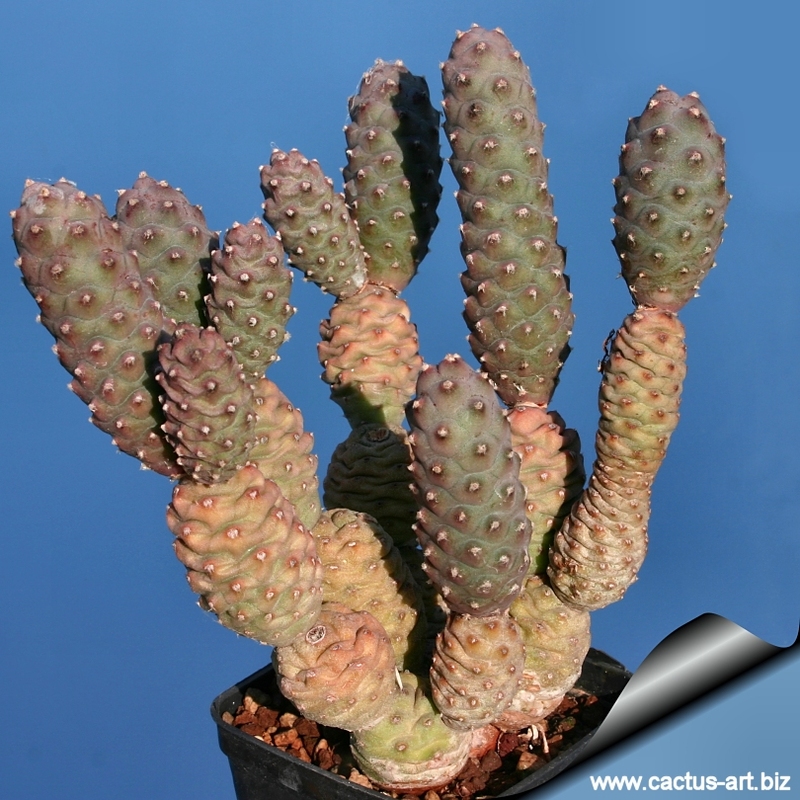 Cultivation: This is one of the easiest and safest cactus to grown. It is very heat tolerant and doesn't need shade in summer. It is easy to grow but usually couldn’t get very tall as segment kept falling apart. It is fairly cold resistant and hardy to -9°C depending on the clone, Need full sun, (with insufficient illumination stems get thinner as a result of the lack of sun) The main growing period is spring. It might produce some new segments in the autumn too. Needs good drainage. With plenty of water in summer grows a lot faster... Keep dry in winter but tolerates long, wet, sloggy, cold winters. Distribution: Western Argentina. It has also been referred to Brazil and Chile, but surely not found in Brazil and almost surely it does not inhabit Chile too. Vernacular name: Pine Cone Cactus, Spruce Cone Cholla. Tephrocactus articulatus var. diadematus Lem. Description: Succulent upright shrub, up to 60 cm, 1.2 m spread. The 'inermis' form of this species-variety is a nearly spineless form of the species with no spines and without (or with very few) glochids on the new growth. These usually fall off as it ages. Stem: It produces dull greyish-brown to earth-tone coloured pine-cone-like globular to elongated stem segments 2 to7 cm long. the segment are hardly tuberculate (except in drying) and generally grow longer and narrower than var. papyracanthus. The segments usually grow one or two new segments each year from the stem tips. Flowers: Yellowish-white fading to pink. Fruit: Globose, 1 to 1,5 cm long, dry. Propagation: Cuttings (or occasionally seeds) it suckers profusely and is very easy to grow by just knocking off one of the 'cones' and stuffing it in the ground. Photo of conspecific taxa, varieties, forms and cultivars ofTephrocactus articulatus.